EVE Search - What are you reading? Father to a murdered son. Husband to a murdered wife. Truth be told, I've been pretty unlucky. There's always a random Pratchett on the go too, reading Mort for the umpteenth time and still finding new stuff to laugh at. Civilized behaviour is knowing that violence is barbaric, but paying other people to do it is business. 'Mein Kampf', for ironic value. Just finished Philip K. ****, The Man in the High Castle. Strange book. Not really sci-fi, more like a psychological novel that happens to be in an alternative future setting. Do you recommend it to casual readers? Hmm. Not really, no. There's not that much of a story, really. It's various characters doing various things and having various thoughts. If you know World War II history, the ideas about what happened with non-defeated Japan and Germany are interesting. But it's just worked into the characters' subplots along the way. Like big news stories that might or might not matter to them. I've read a fair amount of Mr. [Censored]'s works, but I had to resort to internet opinions to help get a handle on the bizarre ending of the book. Amazing that this tripped-out, film noir gritty thing was published in 1962. It gives sound advice about living forever biologically. If fire doesn't solve your problem,you're not using enough. Even more amazing was that he wrote the book that was basis for blade runner in 68. Read it many years ago and had similar feelings. A television adaptation series was made in 2015 and received great reviews. Always amazes me that Starship trooper was published in 59. The combat suites they use are way more advanced (and in some way more realistic) compared to the ones used in the movies. Yeah, Heinlein was one of those old science fiction guys. Where thinking about real world laws of physics, astronomy and other hard science disciplines were what shaped the story. That kind of went out of style along the way, I guess. But Andy Weir's The Martian from 2014 is equally "hard", science-based sci-fi. So hard and nerdy that I couldn't finish it. Good book, I'm just lazy and not that much of a science nerd. One of the best books ever written, imo. With CGA as it is now, a direct movie adaptation could be made of the book. 3 hours of bliss. I didn't know World War Z was based on a book.Must be much better than the film. I've yet to read BNW. I heard its name often but don't know what it is about. Never drink anything that only gets a lukewarm recommendation from an Australian infantryman! Currently muddling through American Gods, though about the 70-page mark it hasn't grabbed me yet. Need a fantasy author for my September reads, if there are any suggestions. Wahoo: The Patrols of AmericaGÇÖs Most Famous World War II Submarine by Richard OGÇÖKane It's a great one, really a page-turner. Authority, Book 2 of the Southern Reach Trilogy on ibooks. by Jeff Vandermeer. I sympathise about American Gods. Two fantasy author suggestions: Steven Erikson (massive Malazan series), Ursula Le Guin (shorter but intense Earthsea series). Huxley's ingenious fantasy of the future sheds a blazing light on the present and is considered to be his most enduring masterpiece." Sounds a lot like Lois Lowry's The Giver. I haven't read that too. The book and movie are very different, the book is something like 60 short stories in chronological order, there's no 'main plot' as it were but it is outstanding (so is the movie). I read a bunch of dystopia/utopia books as part of my thesis, BNW was one of them which I had never finished properly after handing my thesis in. It's a fantastic book though, very believable in parts and very unbelievable in other parts. The world of distraction and saturation that Huxley spoke of has largely become real. One of the best books about the Submarine warfare in the PTO during WW2, written by the ace of aces. All of them are real page-turners, at leat IMHO. First time I have read one of his works. Very good so far (early into it though). I've read Wolf of the Plain, Lord of the Bow, Bones of the Hill and now on Empire of Silver all by Conn Iggulden in the past two weeks. Making good progress on this series. Maybe a bit controversial but I would rather read things that challenge rather than things I would automatically agree with. Not a book I'm currently reading but, King Matt the First is a book I've read when I was at a very young age.The book's name was translated as "Child King" and my copy had no author name on it. I recently re-discovered it. A man feels obligated to lie and say A Song of Ice and Fire. Is it related to "The Horus Heresy" series which is on my "to-read" list? b) how much of it I already knew, in a broad enthusiastic amateur sense, by no means saying this was anything other than thoroughly educational. Short term results of reading this once without going down the Palaeaographical authenticity rabbit hole have been this. Definitely a good read if you're interested in Western Calligraphy. still reading various fallout equestria novels. 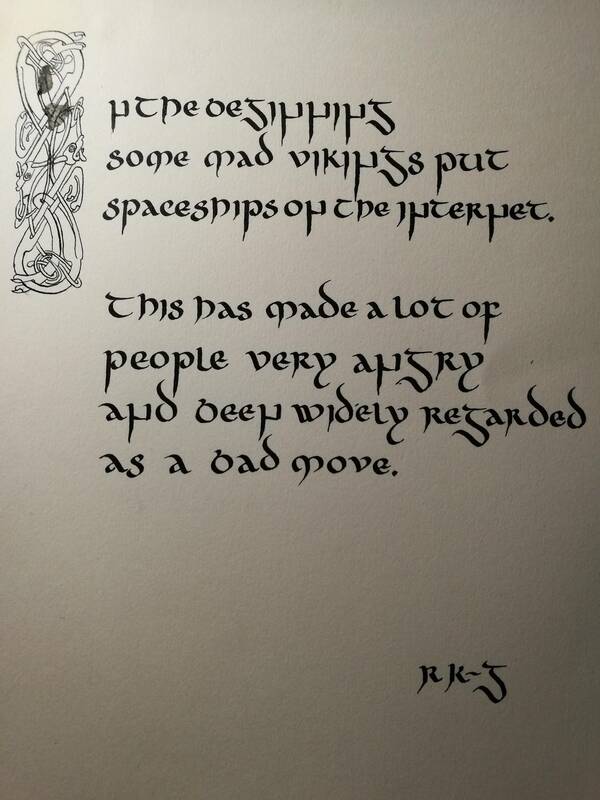 Forwarded that title to an artist type I know who uses a lot of calligraphy. If they don't like it I'll just blame it on this mad hatter guy in an online game I play...if they do like it I will be taking all the credit for it, thanks.